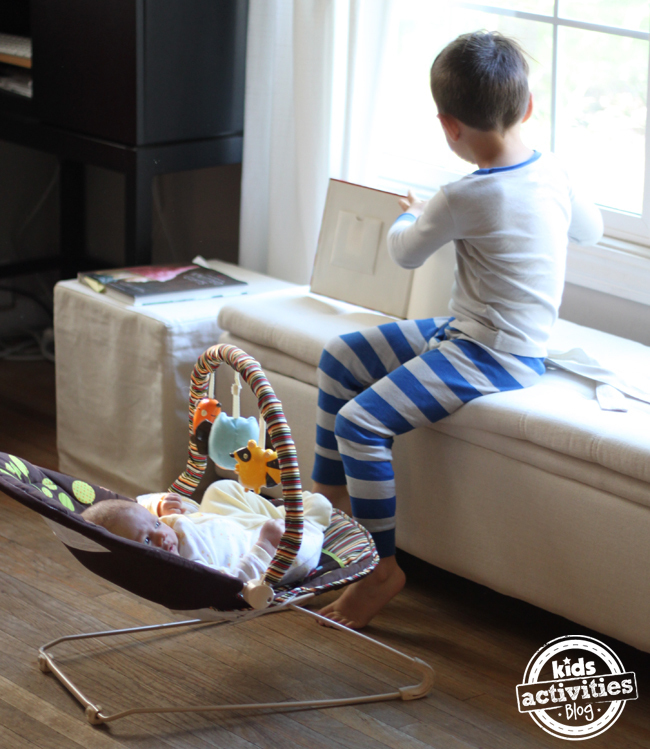 Here are a few tried and true ways your preschooler can help with the new baby. Welcoming a new baby can be a challenge for older siblings. When I was pregnant with my second child I worried, as many of us do, about how my son would handle the transition. I realized that my preschooler loved having a job so I created some ways that he could help with the new baby. So far, he has loved being a big brother and he really is a big help. Adding these simple ideas to your daily routine will help your child feel involved and included. Plus, they can help foster a positive sibling relationship and even help your day run more smoothly. 1. Get things for baby. Little ones are great gofers. Ask them to bring baby his/her blanket or favorite toy. Have them fetch you a clean diaper or burp cloth. These simple tasks will help your preschooler feel important and useful. Be sure to thank them for their help, the positive attention will be very welcome to the new big brother/sister. 2. Entertain baby during tummy time. Often babies find tummy time difficult. A preshooler is the perfect person to help make tummy time, fun time. All the big brother/sister needs to do is sit in front of the baby and sing or chat. 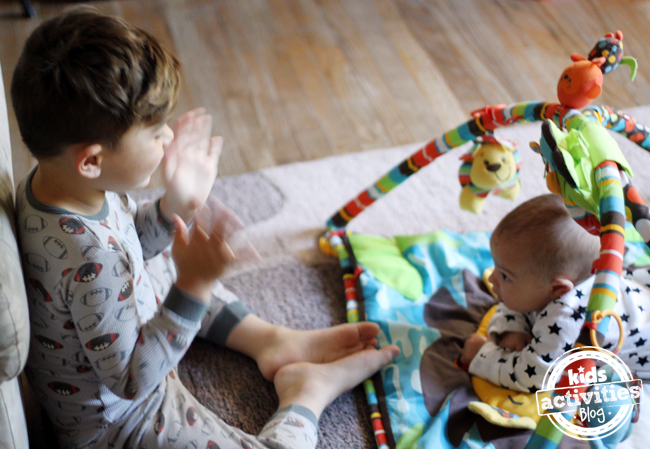 Being in charge of tummy time entertainment helps your preschooler feel like they are playing with the baby. 3. Help with bath time. Letting your preschooler help bathe baby is a great way to involve them. Since infants bathe in their own little tubs it is fairly easy to monitor this kind of help. My son loves gently rubbing his baby brother’s belly with a wet wash cloth. And any little splashes from baby are met with lots of giggles. 4. Read the baby stories. With this activity baby gets exposed to language and enjoys the extra attention while your preschooler practices pre-reading skills. Have you child chose a favorite book (ideally one they have memorized) and tell them that the baby would love to hear it. 5. Teach the baby things. This works great when you need your preschooler to do something. Explain that babies don’t know much about the world and they need help learning. Have your preschooler “teach” them how to brush their teeth or get dressed by modeling the behavior. I hope these ideas help your family adjust to having a new baby. Looking for more ways to help welcome baby? I love these kid made baby toys. 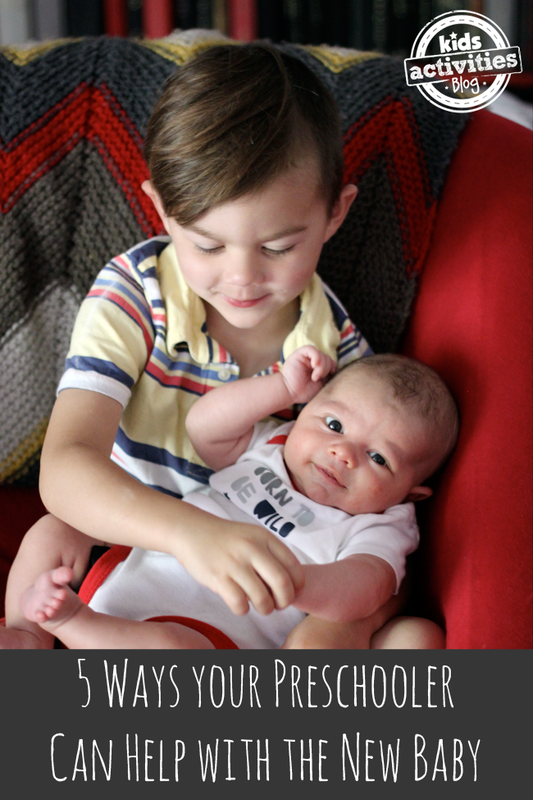 The post 5 Ways your Preschooler Can Help with the New Baby appeared first on Kids Activities Blog.